Generating Credit Reports - The Report includes data on current and historical financial commitments, their payment discipline, and cumulative data from other public and private databases.Evaluating the creditworthiness of the physical person or legal by providing a scoring time. The scoring score is assigned based on a scoring module constituted and developed by Infodebit, based on the statistical data analyzed, usually quarterly in conjunction with the financial commitments of the evaluated person. The copyright on the logic of the scoring module belongs to Infodebit. Notification of persons included in Infodebit with outstanding financial commitments. Only notification by INFODEBIT of debtors will allow the recovery of about 15-20% of the debts without effort or collection costs at the hand of the Creditor. Access to own Report and the right to correct its data in the credit report! 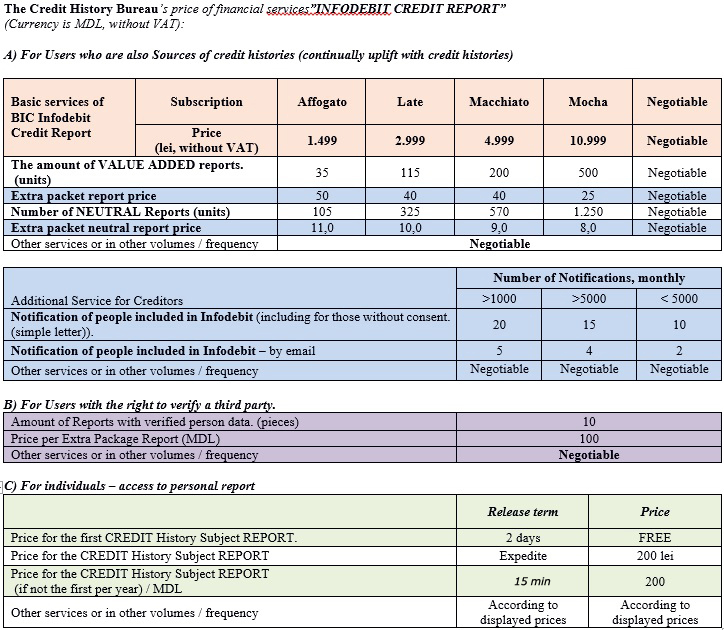 Every fisical or legal person has the right, once a year, to receive from INFODEBIT FREE OF CHARGE, and whenever desires - for payment, without indication of the causes, the report on its credit history, including the information collected in accordance with this law, the sources of credit history formation and on credit history users (info about who verified it and when) to whom credit reports have been issued.Any fisical or legal person is entitled to request modification of the data contained in its credit history by contacting INFODEBIT. By modifying own data (including by filling in the missing fields), you show a goodwill and responsibility towards your own credit history and you can increase the scoring rate (scoring score) offered by INFODEBIT. Sometimes the low-level talks about the lack of data about your credit history, but not a bad credit history. It is important to keep the data true. Open access information about companies registered in Moldova - This service has been developed to facilitate access to open government data and to help citizens gain added value by using them. The project is based on the reuse of public data about companies registered in the Republic of Moldova, presenting them in a user-friendly manner, so that anyone can easily analyze and process them, including the history of the changes that took place in the list of founders, the legal address, or about company administrators. This service is dedicated to both consumers who can find information about the company they are going to buy services or products, as well as entrepreneurs who can easily find out who they are doing business with, and if there are no hidden interests behind companies. At the same time, the site also makes it easier for journalists to find easier dataa about individuals and legal entities.